Interesting things I have seen in Cologne. Guards are posted around this courtyard at certain times of the day to keep people from walking on it because it could be heard in the music hall below. 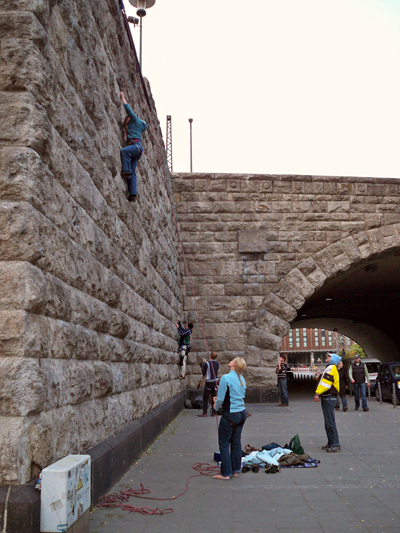 Rock climbers practiced on the wall of the Hohenzollern Bridge by my hotel. The light switches and the toilet flush button in my hotel are all huge. 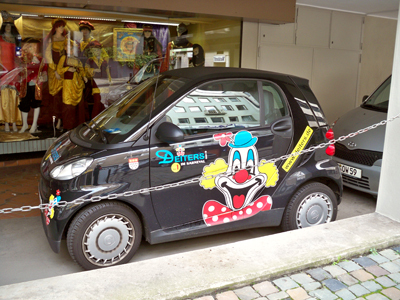 I love the little cars in Cologne. 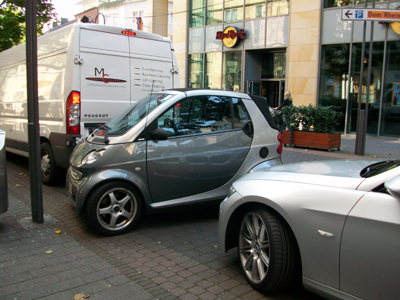 Look how this Smart Car sqeezed into a tiny parking space. Aaron should be getting his Smart Car soon. Maybe it will come with a clown on it. Hah-hah! I couldn't figure out why there were locks attached to the fence along the bridge walkway. This one is going to bug me. UPDATE: I have been informed that these are Love Padlocks! Love padlocks are a custom by which sweethearts affix padlocks to a fence or similar public fixture to symbolise their love. When I was in Italy this summer I saw a bunch of locks too, and I was baffled. My mother told me that it's a thing couples do, often on their honeymoons or in particularly romantic places. The woman puts the lock on a fence or hard-to-reach place and gives the guy the key, as the key to her heart. 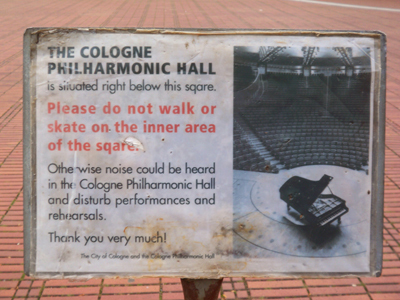 Your photos of Cologne are so great - I really enjoy seeing them! I saw the same thing on the Great Wall of China! Apparently it's supposed to be a symbol of love and devotion, each lock representing the couple that put it there. Incredible how it's practiced around the world! Here is a look at some Love Locks in Hungary. The locks are inscribed or scratched with the couple's names and the key is throw away. I have a much less romantic theory for the locks mystery. Perhaps people chained their bikes to the fence, and the chains just got cut. grace - no... they were up too high and were too small locks to be for bikes. 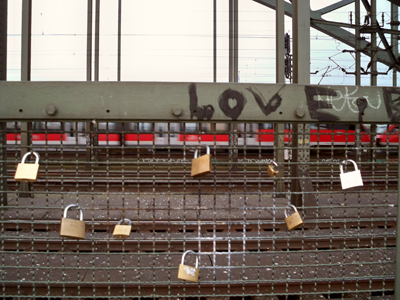 i only just noticed "love" written above the locks. great picture! I've seen it on Japanese/Taiwanese TV drama...just like what Mia said...with couple's name on it...throw the key away..usualy in the ocean :) couple be together forever!